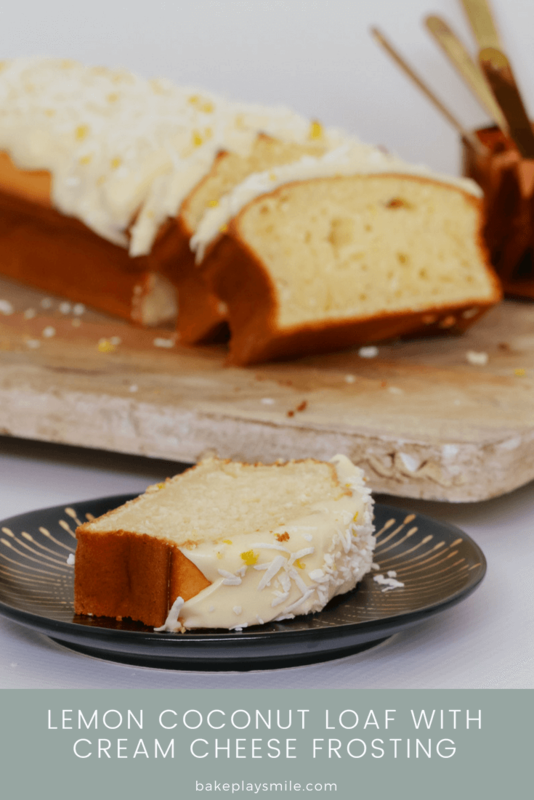 A simple and delicious Lemon Coconut Loaf made with greek yoghurt and smothered with cream cheese frosting… the perfect morning tea treat or lunch box snack. Printable conventional and Thermomix recipe cards included. Bake Play Smile has always been (and will always be!!) about simple and yummy recipes. When I first started this blog, I would question over and over again why anyone would want to look at my recipes. They’re all easy. There’s nothing fancy or special about them. You certainly don’t need any kind of baking skills to make them. 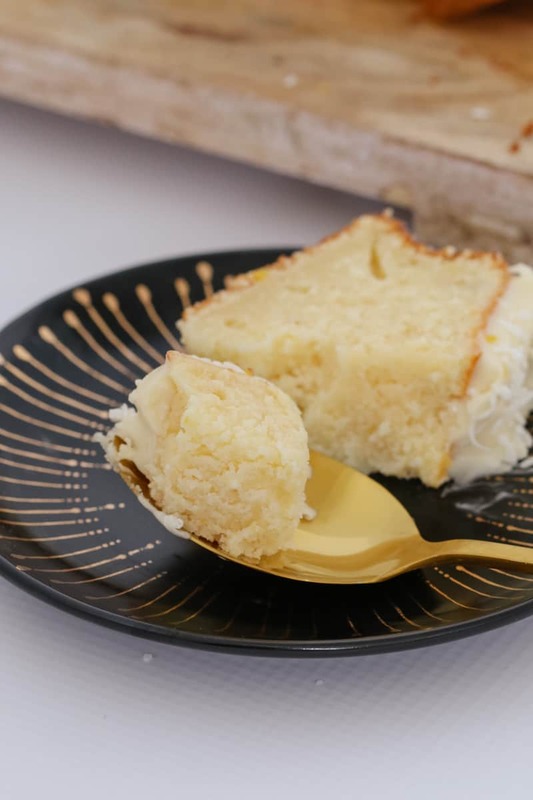 But after a while, I realised that was exactly why people wanted to see the recipes – they were easy, they didn’t need any expensive ingredients and they were quick to make. And so, over the past 6 years I’ve kept going with my motto of ‘simple and yummy’. 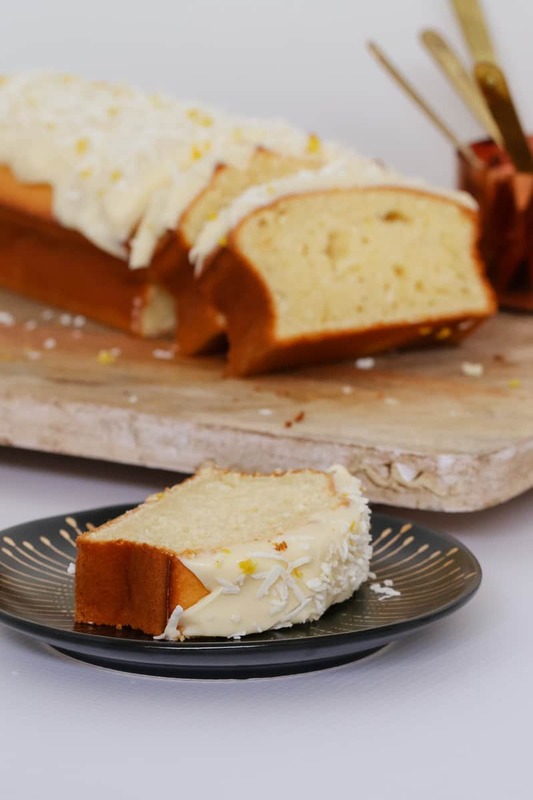 And this Lemon Coconut Loaf with Cream Cheese Frosting is exactly that. Its only going to take you a few minutes to whip up and… oh my gosh, it’s going to taste SO good!! 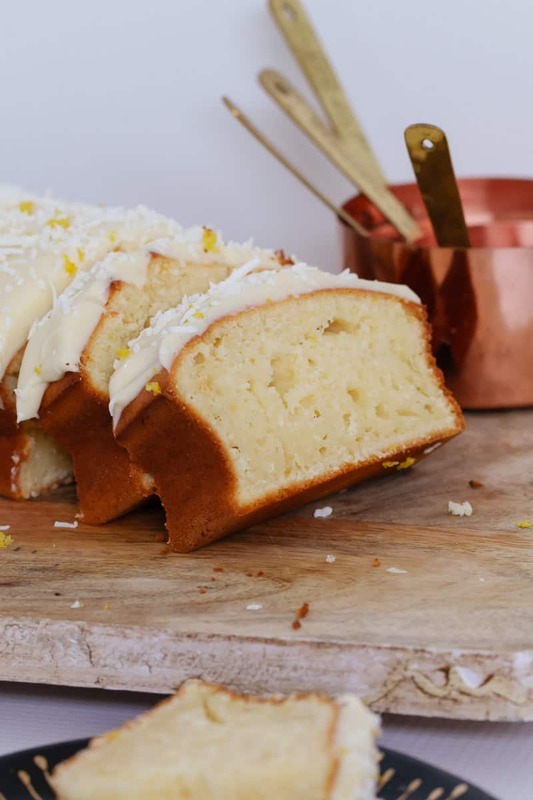 The Lemon and Coconut Loaf is made with greek yoghurt which keeps the loaf really dense and moist. While the lemon zest and lemon juice give it a beautifully light tang. 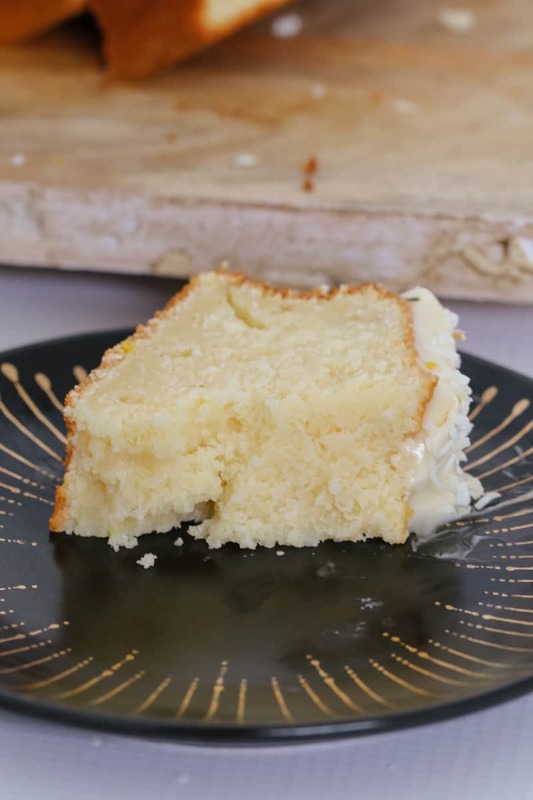 But lets be serious… the star of the show here is definitely the cream cheese frosting! If you haven’t made it before – OMG your life is about to change for the better! 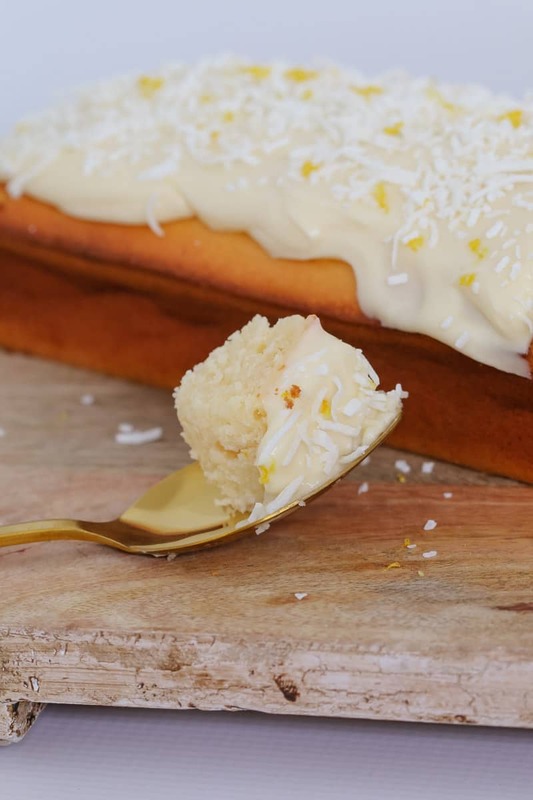 And if you have made it, you’ll know how hard it is to stop yourself from eating all of the frosting before you ice the Lemon Coconut Loaf. 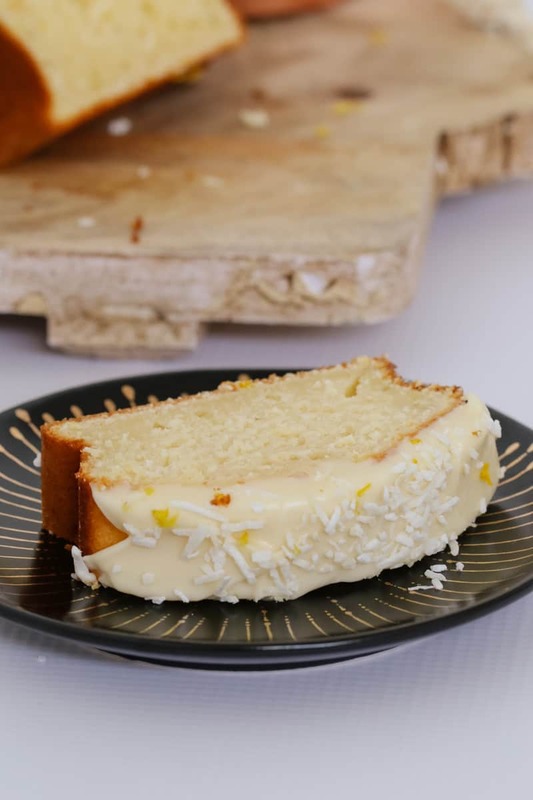 And hey, if you’ve got lots of spare lemons lying around and feel like doing some more baking (after you make this baby of course!!) then check out my collection of lemon recipes here. 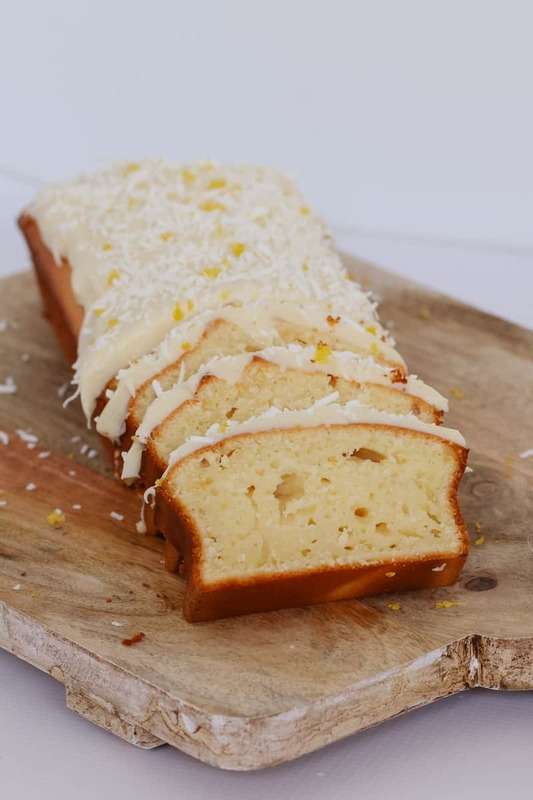 So next time you’re after a quick and easy recipe that is perfect for morning tea, fundraisers, school fetes, lunch boxes… anything!! 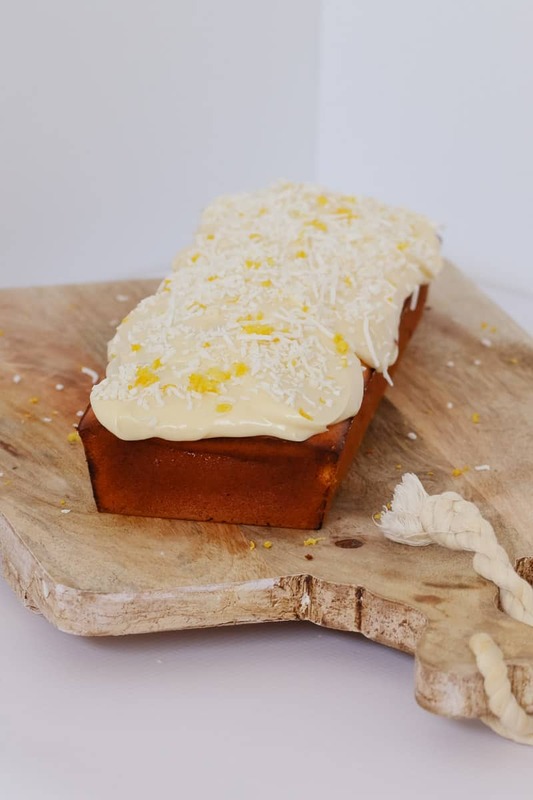 !… make sure you give this Lemon Coconut Loaf with Cream Cheese Frosting a try (and just remember that you must, absolutely MUST, taste test a lot of the cream cheese frosting as you go!!). 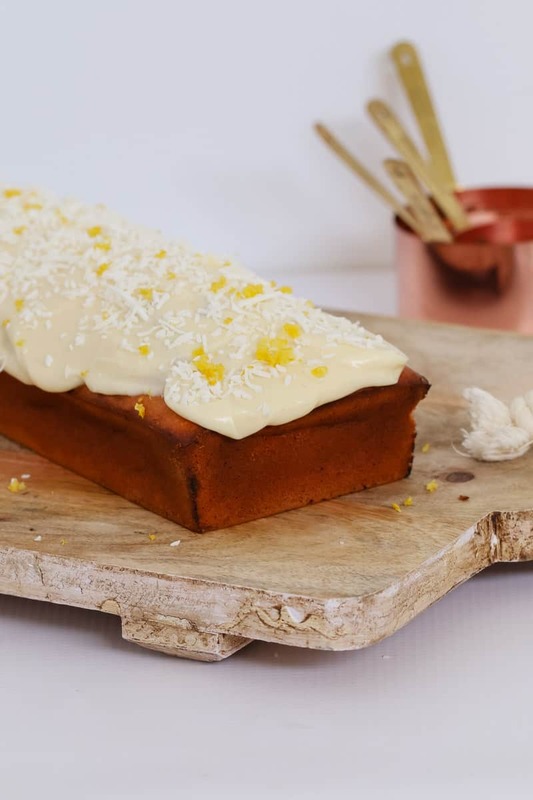 A simple and delicious Lemon Coconut Loaf made with greek yoghurt and smothered with cream cheese frosting... the perfect morning tea treat or lunch box snack. Preheat oven to 170 degrees fan-forced. Grease a non-stick rectangular loaf pan (approx 23 X 13cm) well and set aside. Sift the plain flour and baking powder into a large bowl. Add the coconut and salt and mix to combine. Set aside. In a seperate bowl, whisk the greek yoghurt, caster sugar, eggs, lemon zest, lemon juice and melted coconut oil until well combined. Pour the mixture into the prepared tin and bake for approximately 45 minutes or until cooked through when tested with a skewer (see notes). Allow to cool for 15 minutes before transferring to a wire rack to cool completely. 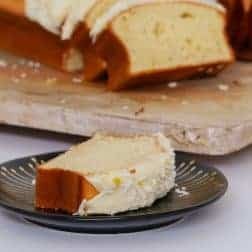 To make the frosting, beat the cream cheese, butter and lemon juice together until smooth and creamy. Slowly add the icing sugar and continue beating until combined. 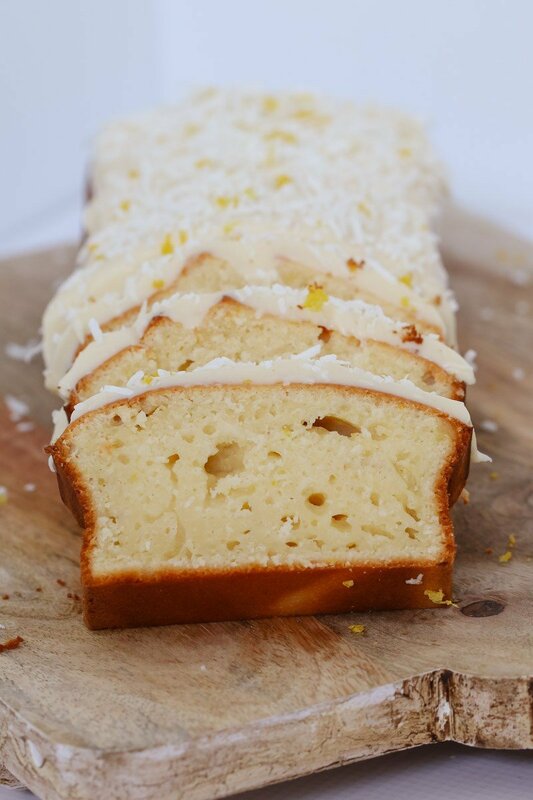 Spread over the cooled lemon coconut loaf and sprinkle with extra shredded coconut and lemon zest (optional). If your loaf is browning too quickly in the oven, loosely place a sheet of foil over the top and continue cooking. Add the plain flour, baking powder, coconut and salt to the Thermomix bowl. Sift by pressing the Turbo button in 1 second bursts 8-10 times. Set aside in a seperate bowl. In a clean Thermomix bowl, add the the greek yoghurt, caster sugar, eggs, lemon zest, lemon juice and melted coconut oil and mix on Speed 5, 5 seconds. Scrape down the sides of the bowl and mix for a further 5 seconds. Add the dry ingredients and mix on Speed 5, 5 seconds. Scrape down the bowl and repeat for a further 5 seconds (or until combined). To make the frosting, place the cream cheese, butter and lemon juice into a Thermomix bowl. Mix on Speed 6, 10 seconds. Scrape down the sides of the bowl and repeat for a further 10 seconds or until smooth and creamy. Add the icing sugar and mix on Speed 6, 10 seconds. Scrape down the sides of the bowl and repeat for a further 10 seconds. what could i use instead of coconut oil if i dont have any? will that help to reduce the calories if swapping to something else? the greek yoghurt – what brand or fat/sugar grams or % are you using? what is the calories without the delicious icing? or could you give me a weight for the serving size? Without the cream cheese icing 🙁 the loaf as 8 slices comes out to 274 Calories (but that’s with low-fat Greek yoghurt). With icing it was, at least, another 100 Calories (but oh, so worth it, I’m sure!). This cake looks amazing and I want to eat the whole thing! Just wondering if it’s okay to freeze with the frosting? Hi Charmaine, I don’t usually freeze cream cheese frosting but you could try and see what you think!